You can substitute about 400 meters of any sock weight yarn. 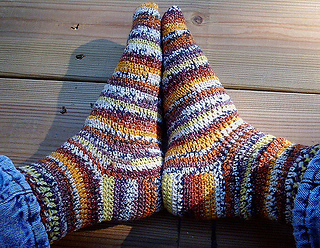 I like crocheting socks from the toe-up. You can try them on as you go and adjust the calf length to the amount of yarn remaining. I also like to crochet the heel as I go; no after-thoughts for me. The custom fit is better and you’re finished when the cuff is done. 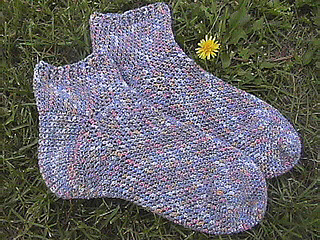 I designed this pattern so I could crochet socks my way: toe up in one piece with a gusseted heel. Upon closer reading of the pattern as posted, I’ve realized the source of the confusion on the heel placement. When placing the markers for the gusset round, only place a beginning marker and a side marker. Do NOT place a marker in the center top of foot. The “midpoint” marker referred to in Gusset Round 10 is the SIDE marker. This extra marker may also explain why some crocheter’s socks were coming out huge. If you were increasing at each of 3 markers (instead of 2) each round, your stitch count would be way off and obviously the sock would be way larger than intended.